If you are looking for a customised structure GRDC is the place to come, from a simple park shelter that you want 'tweaked' to a lengthy cable stayed footbridge our experienced design and engineering staff can produce the structure you are after. Our engineer is a fully qualified and registered structural engineer with experience in timber, steel and concrete construction and full engineering certification is issued with every single GRDC structure specific to that structure. The recently installed custom shelter at the Chirnside Park Football Ground for the Wyndham City Council is a perfect example of our design capabilities. 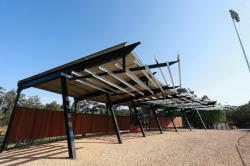 Wyndham were looking for a unique structure to provide shade for their existing spectator mound and together with GRDC came up with a design that is contemporary and practical and is the only one of it's kind in Australia! No matter how complex the structure is you are looking at, our design team will work with you to achieve the best outcome to suit your projects requirements within your budget. Custom Work GRDC has an extensive range of pre-engineered structures however we specialise in custom ‘one off’ projects. Contact us below for more information. © copyright 2019 GR Design And Construct Pty Ltd - All rights reserved.